Wild rice stuffing with butternut squash, pecans, and dried cranberries. 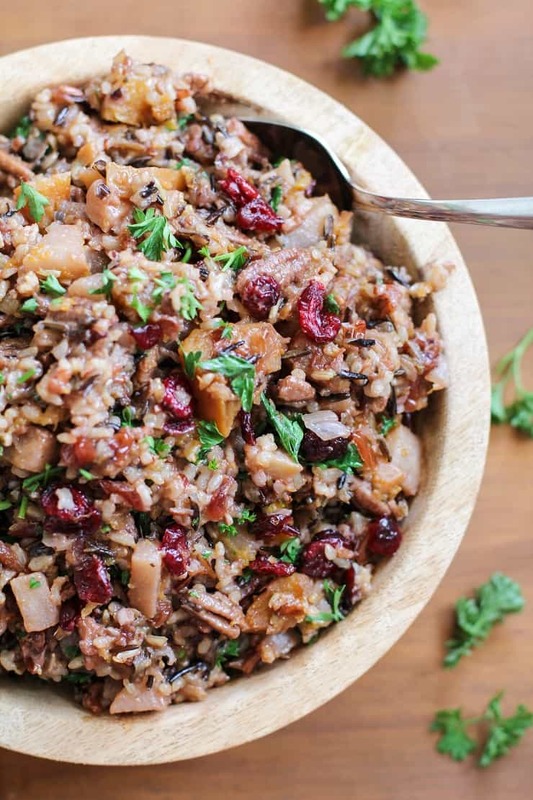 This healthy gluten-free stuffing recipe is perfect for sharing over the holidays! I havea doozy of a confession here, folks. I’m not a fan of bread stuffing. BOOM! Can you even believe it? Or maybe you can relate? One of my brothers could make the focal point of his entire Thanksgiving feast revolve around the bread stuffing, complete with a mashed potato fortress and a gravy moat. But not this sista, no sir. There’s just something about the moosh that does me wrong. And I’m not partial to stuffing that has been stuffed inside the bird cavity, either. Girl’s got stuffing criteria. 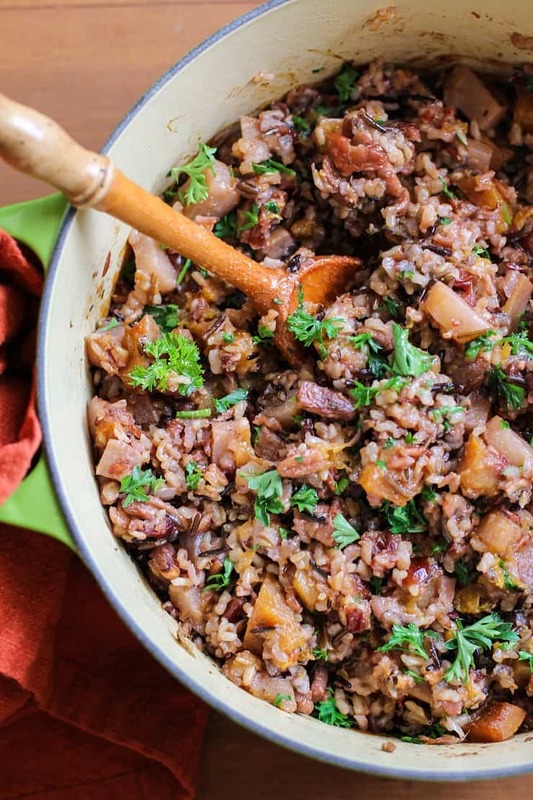 But wild rice stuffing (or dressing if you will)? I can dig. This rice includes several. We’ve got butternut squash, pecans, dried cranberries, and pears – warmly spiced with cinnamon, and herbed-out with parsley. All these warm fall flavors make for an inviting dish, and guess what? This recipe makes a ton – perfect for you and your 10 Thanksgiving guests to enjoy. 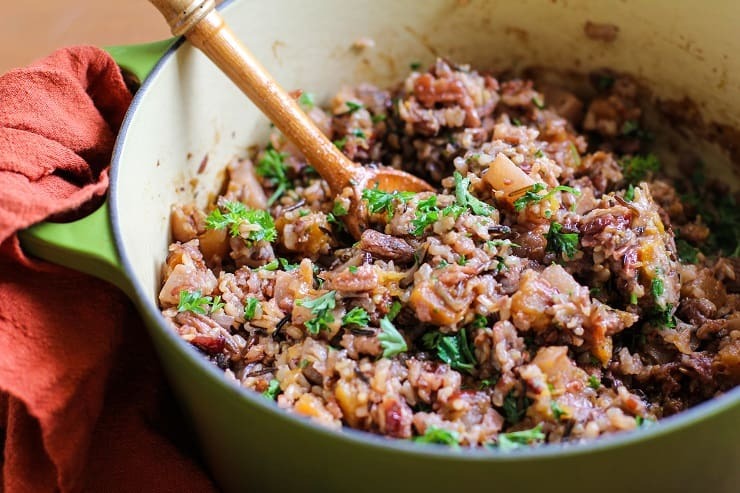 Make this heaping cauldron of non-bread non-stuffing stuffing for your holiday feasts. Change ups: You can sub in an apple for the pear, use walnuts instead of pecans, and golden raisins instead of dried cranberries. For the liquid, I used water, but you can use veggie broth or chicken broth. Using chicken broth will yield a more authentic stuffing flavor. And that’s it. A little saute on the veggies, a little steaming of the rice, a little baking in the oven for optimal crisp…you’ve got yourself a gluten-free, vegetarian (or not) stuffing recipe to feed an army of friends and family. Place dry rice in a bowl and fill with water. Soak for 10 minutes. Add the oil, onion, celery, and butternut squash to a large oven-safe pot or Dutch oven. Saute over medium heat for 5 minutes, stirring occasionally. Add the chopped pear, garlic, rice, sea salt, oregano, and cinnamon and stir, saute 3 minutes. Add the dried cranberries, water, wine, orange zest, and bring to a full boil. Reduce heat to a simmer, cover, cook 40 to 50 minutes, until most of the water has been absorbed. Preheat the oven to 350°F. Uncover the dutch oven, place on the center rack of the oven, and bake 10 to 20 minutes, until all of the water has been absorbed and top is crispy. Remove from pot from the oven and stir in chopped pecans and fresh parsley. Taste the stuffing and add salt to taste. Serve alongside your holiday entree or use as turkey stuffing. Yum. And I’ll take both kinds of dressing. Because: carbs. That’s sad 😛 Stuffing is all about the bread…but I do love wild rice stuffings too! The bite and chew is always so perfect! im not much of bread stuffing or anything mushy texture in general..however this with some texture, i can do it. No to cavity stuffing either..
Um yea, I agree, this looks way better than anything you can pull out of a turkey’s cavity. I do love me some bread stuffing (well, the kind served outside the bird! I don’t like the kind that’s in it!) … but this sounds absolutely fantastic! 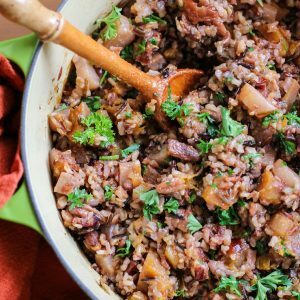 Wild rice is a favorite of mine so I can definitely get down with this! This looks like an anytime recipe to me. Why wait for a holiday? Yum! I’m definitely not a fan of bread stuffing (although many of the recipes that people have been posting lately may be changing my mind!) but rice? I’m allllways here for rice 🙂 This looks awesome! Thanks sooooo much for those of us who can’t have gluten, and simply those of us who also want to eat healthier alternatives. I’m going to test this recipe this weekend. Thanks! When you add the rice, do you add the water that it has been soaking in? About how much water should that be? Unfortunately, I haven’t gotten to eat stuffing in YEARS due to my family loving meat in it…I think I’m going to have to whip up a batch of this all for myself this year!